Despite appealing performers, Hollie Meyers-Shyer’s Home Again (D+) misses the mark in nearly every way. Reese Witherspoon plays an L.A.-based single mom whose brush with three plucky young filmmakers (Pico Alexander, Jon Rudnitsky and Nat Wolf) prompts an unconventional living situation. Candice Bergen and Michael Sheen are among those in the ensemble wasted by a phony series of unbelievably benign events. Nobody behaves convincingly in their designated profession. The biggest first world problem of all is a rom com that’s not funny or charming. Writer and lead comic actress Amy Schumer couldn’t ask for a better feature film maiden voyage vehicle than Judd Apatow’s Trainwreck (B), a screwball character study shrouded in rom com clothing. Schumer’s central character is a boozy and sexually liberated magazine writer who meets her match in a well-grounded sports physician, warmly and effectively played by Bill Hader. Both Schumer and Hader are unconventional casting choices; and honestly, I wasn’t entirely convinced of their chemistry despite lived-in performances. But the film packs a comic punch with jabs at the mores of modern dating and has moments of poignancy in the heroine’s relationship with her misanthropic papa. There are shades of Pretty Woman and Bridesmaids as the film navigates some typical narrative arcs, and “Apatowesque” will now just be my adjective for overlong comedies. But as a sassy star is born, her film is a filling and funny frolic. 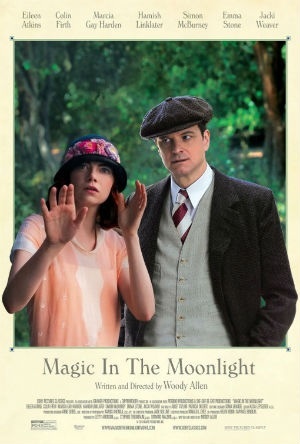 Woody Allen’s Magic in the Moonlight (C-) is a very undernourished romantic comedy about a pompous magician rooted in realism (Colin Firth) endeavoring to out a skilled spiritual medium (Emma Stone) as a fraud while slowly surrendering to her charms. The film feels like a rushed first draft and a trifle of a notion with no standout performances. Squandering lovely settings in Germany and France and the goodwill of likable actors, the film is an unoriginal and labored dud. It’s not clear why Allen would care to share these characters or find them to advance his themes in any substantial way. The film falls into his category of lesser works.